Methodists mark May 24 as Aldersgate Day. in 1738 on that date, John Wesley ‘experienced confirmation of his salvation by the grace of God’ in a meeting room on Aldersgate Street. Wesley wrote: I felt I did trust in Christ, Christ alone, for salvation; and an assurance was given me that he had taken away my sins, even mine, and saved me from the law of sin and death. The meeting room no longer exists in London. But the site is marked with a large flame monument. The monument is on Aldersgate Street in Nettleton Court. 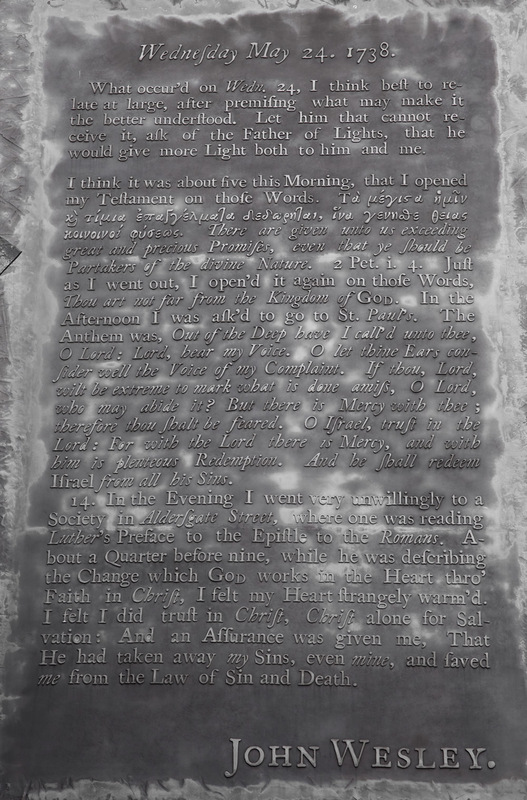 Here is the text on the monument. The monument is along the John Wesley Walking tour offered by the Methodist Heritage website that also includes Wesley Chapel and St Paul’s Cathedral.